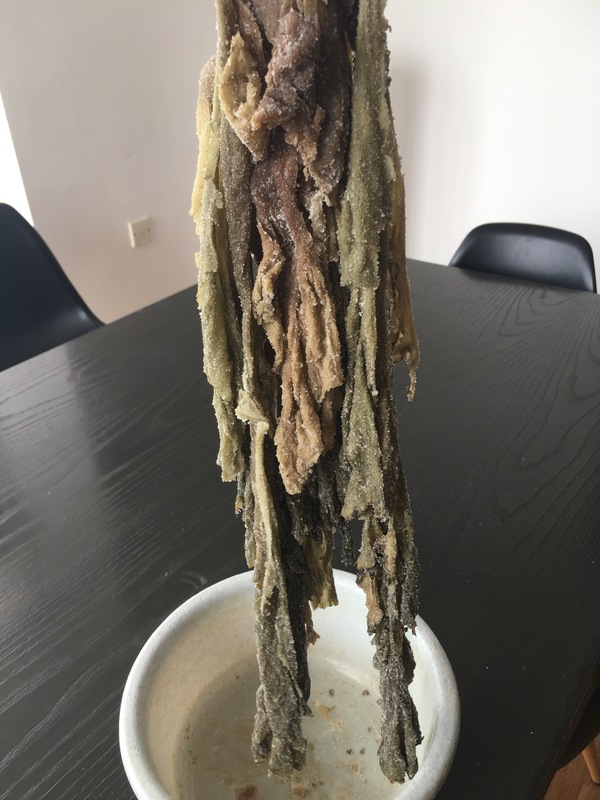 There are some really ugly dishes. And they look ugly because the ingredients look pretty gross. Yesterday I was in the wet market and snooping around a dried food stall when I spied some preserved vegetables and the craving for Hakka Mui Choy and Pork Belly came on me. I am a Hokkien Chinese but I’ve always said that my appetite is international. I’ve friends who have asked if I’m Peranakan, perhaps because I’m so food-obsessed and have a voracious appetite, but the truth is that I’m a Singaporean who was born in Malaysia and so all my food memories are of south-east Asian cuisine from Malaysia and Singapore. The Hakka people were the most diasporic of the Chinese and take their identity not from geographic location but their language and culture. This is a tough people with a great deal of stoicism and independent-mindedness. In dispersing to South-East Asia and beyond, the Hakkas brought their cuisine which usually featured cooking with preserved foods, and stewing and braising for long durations to bring out the umami flavours of the dishes. Braised pork belly and preserved vegetables (mui choy 梅菜）is one of the most well-known and beloved Hakka dishes. 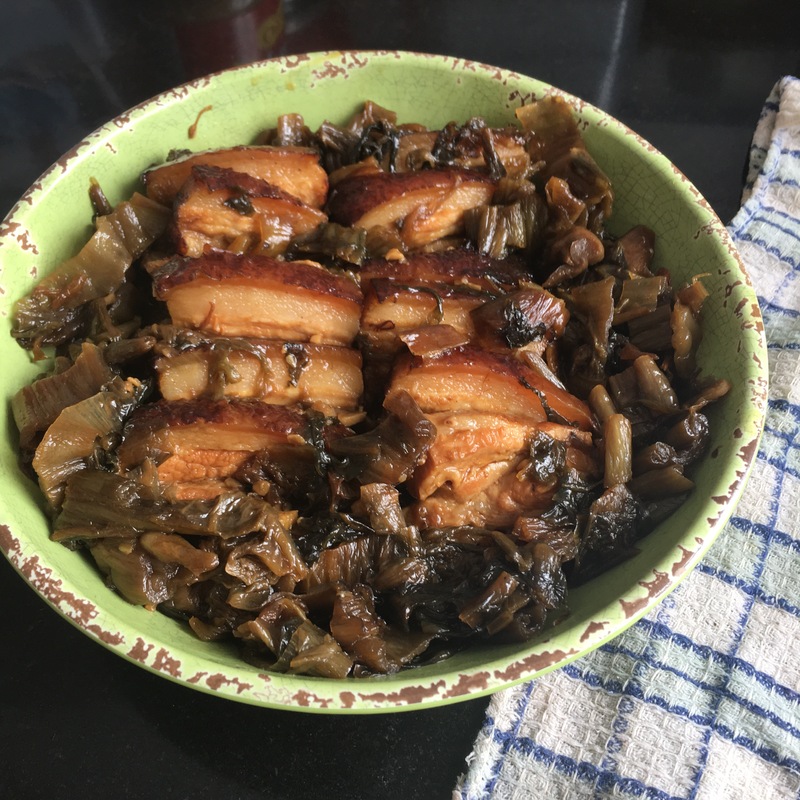 The luscious mouth feel of the pork belly with the preserved vegetable that has soaked up all the rich flavours of the braising liquid is amazing. The dish itself looks unprepossessing – layers and shades of brown, but to a Chinese person, there may be bells ringing in our minds as we spy the glistening pork nestled by the tender vegetables. Mui Choy can be found in dried goods stores in Singapore. There are 2 varieties, the sweet and the salty type. Most Mui Choy recipes use a combination of both, but I did not use the sweet Mui Choy as this is encrusted with sugar which would surely spike my hypocounts. Preserving vegetables with salt is probably something unique in Chinese food; I suppose it is pragmatic and cheap and is an easy way to lend flavours to a dish. Mui Choy is a preserved form of leafy mustard green vegetables. It looks almost like seaweed in this picture but does not have a seaweedy flavour. Traditionally, Mui Choy has to be stewed or simmered then steamed in a bowl for about 2 hours. The Instant Pot cuts the cooking time by half. I also love the pot-in-pot method which allows the pressure-cooking with a smaller amount of braising liquid. A lot of times, direct cooking in the pot ends up with more liquid than needed as the pressure cooker needs at least 1 cup or so of liquid to bring it up to pressure. The pot-in-pot method removes the need to reduce the braising liquid further after the pressure-cooking step. Surprisingly, this dish is not too salty or oily, but the umami flavours beg to be carried by something blander. This is usually served with rice or rice porridge, which if doing a low carb diet can by substituted by cauliflower rice and cauliflower porridge. So here’s the recipe for Mui Choy with Pork Belly. Ugly dish but oh so good! 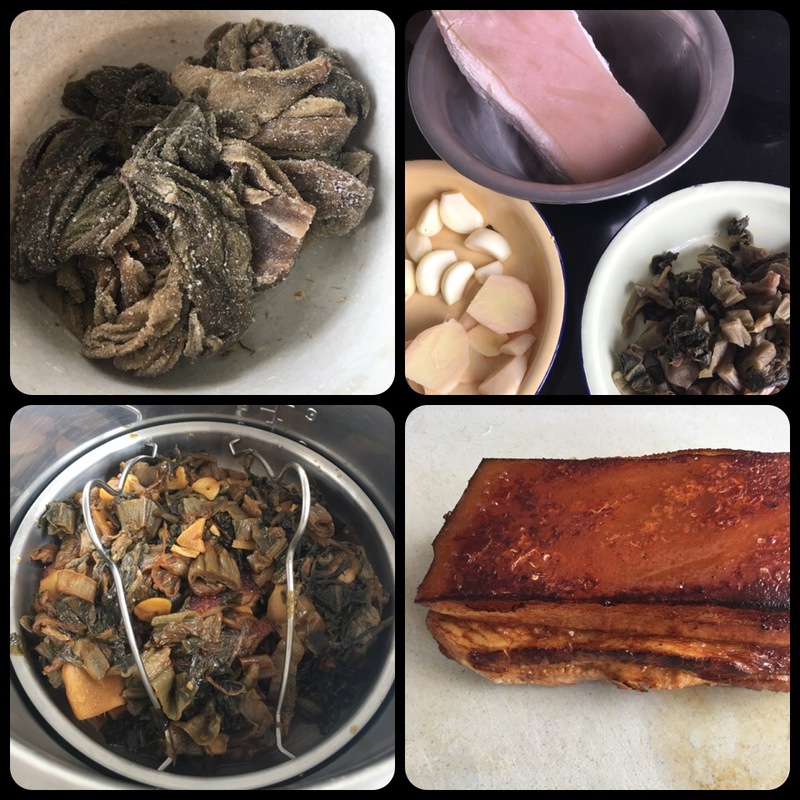 From top left in a clockwise direction: preserved mustard greens; ingredients for the dish (pork belly, ginger, garlic and Mui Choy); seared pork belly; pot-in-pot dish. Rinse the mui choy thoroughly of the salt and other bits of sand. Soak for 30 minutes. Discard the water, then squeeze the vegetable dry. Chop into 1 cm lengths and set aside. Bring a large pot of water to boil. Blanch the pork for 5-10 minutes. Remove and pat dry and coat the pork skin with 1 tsp of dark soy sauce. Mix the dark and light soy sauce, sesame oil, Shao Xing wine, oyster sauce and sugar substitute together in a bowl and set aside. In a non-stick pan, fry the mui choy till it is dry, then set aside. Add the oil to the pan, then sear the pork belly on all sides, starting from the skin side. Remove and allow the pork belly to rest for a while. Slice the pork belly into 1 cm thick slices. The pork may still look pinkish in the center. In the same pan, sauté the garlic and ginger pieces till fragrant and slightly caramelized. Add the mui choy in, followed by the sauces and the star anise. Stir though well. Add the chicken stock and pork pieces and simmer for 5 minutes, turning the pork pieces over so that they get the brown colour of the stock. Put 1 1/2 cups of water into the Instant Pot. Place a trivet at the base of the pot. Carefully lay the pork belly slices in layer on a smaller pot insert (this is a pot-in-pot method for the Instant Pot). Cover the pork pieces with the vegetable and pour the braising liquid over it. Place the pot insert into the Instant Pot. Seal and put into manual high pressure mode for 4o minutes. When done, you can do a quick pressure release and remove the pot insert. Transfer the pork belly slices into a serving bowl and arrange the mui choy around it. Serve hot with cauliflower rice or cauliflower porridge for a lovely low carb Chinese meal. Great looking dish. I’ll have to see if I can find muy choi in Winnipeg. Would you be able to find preserved mustard greens at an Asian grocery? Possibly, we have several such stores.